We awoke to a bright Saturday, somewhat brighter than the weather forecast. That, however, would change. After typical and magnificent indecision about the plans for the day - Cathy being our queen of "I'm not sure yet" - we headed out in dribs and drabs. EMC at an Idea sale? Now that would be an oxymoron. Bikes and feet went to Ben Macdui and/or Derry Cairngorm. Others had a gentler day on Beinn Bhreac. 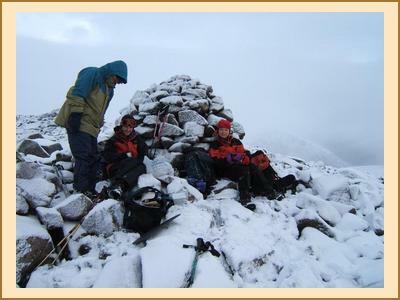 Keith and Nicola climbed "a Corbett to the east". 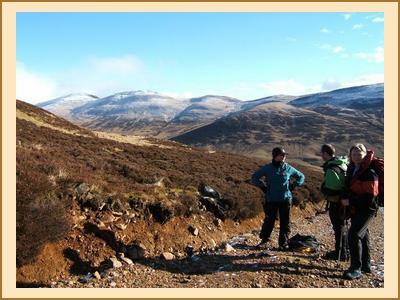 The author headed up Glen Ey to climb An Socath and Beinn lutharn Mhor via Mam nan Carn. Going up the shoulder of An Socath he caught a glimpse of a black and white small cat-sized creature - a feral cat, or perhaps a polecat? What it really looked like was a skunk, honest! Anyway it soon ran off when it smelled me. I suppose Audrey Baxter would have a recipe for it - "Cillen Skunk"? It must be the vinho verde! It started snowing on the walk after about an hour after those on the north side of the Dee got it. Dinner was preceded by a discussion on the merits of the Scottish Parliament and the rite to vote which Kenny condemned because other folk get to vote a different way. Ah democracy! having the better of it. The consensus was that we had all been a bit conservative in our aspirations, particularly as the car sun visors were pulled down the whole drive south.